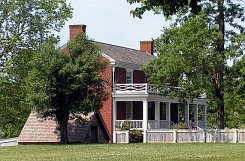 Descendants of Wilmer McLean gathered on Monday for their first tour of his house in Appomattox, Virginia—the same house where Grant accepted Lee's surrender at the close of the Civil War. The oft-repeated irony is that McLean, who lived in Manassas, had moved to Appomattox after the first Battle of Bull Run to escape the war. “He used to say that the war started in his front yard and ended in his parlor,” said Patrick Schroeder, a historian with the Appomattox Courthouse National Historic Park.